Synchromesh: This allows you to drive vehicles with synchromesh gearboxes or automatic gearboxes only (single clutch). Roadranger: This allows you to drive any type of HR vehicles (double clutch). Plus we have an automatic truck if you prefer. Open new possibilities with an open class HR Driving Licence. 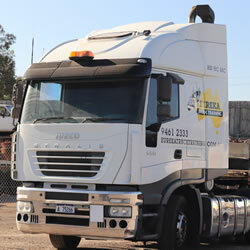 This licence entitles you to drive a Heavy Vehicle with 3 or more axles and a gross vehicle mass of 8000 kg. The ‘’open class’’ licence requires a knowledge of the Road Ranger gear box and a ‘’double clutching’’ technique to enable smooth gear changing. The HR-B Licence entitles the holder to drive HR vehicles with automatic and synchromesh gear boxes. 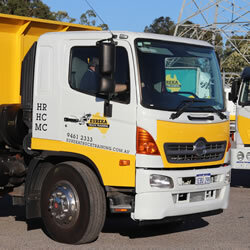 While not as challenging as the Road Ranger, the HR-B Licence opens many employment possibilities. 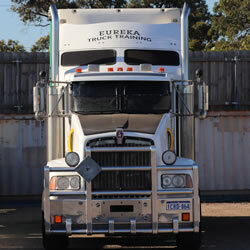 Many transport companies do not necessarily insist that drivers must possess an open class or B Class HR licence. Substantial career opportunities exist within the area of bus and coach driving, which only requires an automatic licence to be successful within a truck driving role. HR Licence allows you to drive Heavy Rigid – more than 8 tonne Gross Vehicle Mass (no axle limit) +/- trailer (max 9 tonne Gross Vehicle Mass). All HR assessments are conducted with our approved assessors onsite.